Hello and welcome to the Autumn 2014 newsletter. It already seems an age since we held auditions for 'The Sorcerer' and the panel was delighted and impressed with the high standard of auditions which were presented. Music rehearsals are now well under way and your MD is very happy with the results being achieved! 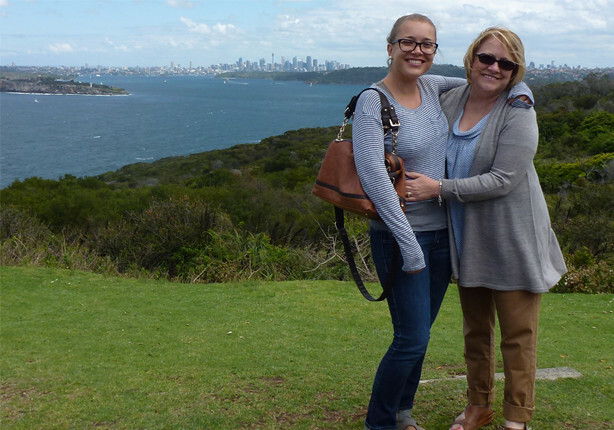 We have a real mix of articles for you in this newsletter; Margaret shares moments from her trip to Australia and we learn more about Stephanie than we'd ever dared!! Following our AGM at which the above officers and committee were elected, rehearsals got under way for The Sorcerer which will be performed at The Maddermarket next May 6-9. We started with a few general music run throughs to aid familiarisation before the principal auditions on 28 September. Chorus rehearsals then began for real. We welcome as new members this year Jen playing Dr. Daly and Rowan who has the role of Constance. Other newcomers in the chorus are Emma and Heather. Your committee have decided that the show for 2016 will be The Gondoliers, last performed in 2006, our second show in The Maddermarket Theatre. The roles of Stage Director and Musical Director have yet to be decided. Did you miss me? Did you even notice that I’d gone? Well… I’m back! What an amazing trip. Our eldest daughter Sophie is currently living in Manly, just across the bay from Sydney, with her lovely partner Sam, and working as an A and E doctor. Sadly for us she’s on duty over Christmas this year so Robert and I tossed a coin and I won. I was going to see her. My brother and his wife are great travellers and decided to come too so the three of us spent many happy hours planning this trip - where we had to go and what we had to do. 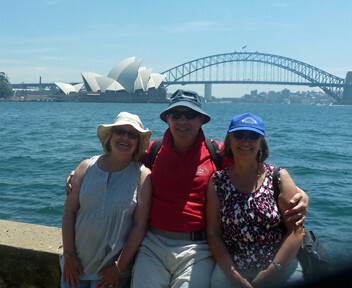 We stayed in a lovely apartment overlooking Manly Wharf where Sam commutes to Sydney every day on the Manly Ferry. 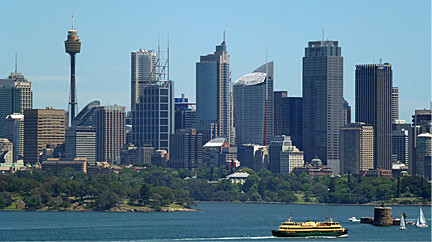 A half hour trip with the reward of the Opera House and the Harbour Bridge coming into sight on each voyage. Certainly beats the tube and the traffic. Sophie had booked tickets for the King and I which was being performed in the Opera House - so expensive but we knew it would be a fabulous performance. We’d read that the sets were outstanding and that the costumes were fantastic. We had centre front dress circle seats, lucky us. Well, it would have been except poor Sophie got the day wrong and we arrived at the Box Office a day late! The very kind ticket lady had some restricted view seats vacant and gave us those. Not quite the same but so much better than nothing at all and we did enjoy the champagne in the bar in the interval right above the harbour. 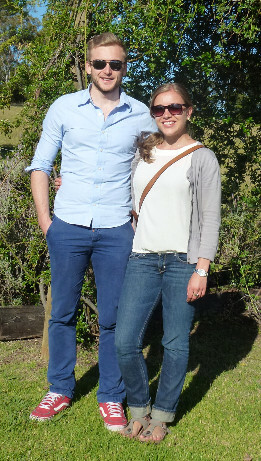 Our first weekend was spent in the Hunter Valley tasting delicious wines. We rented our own little house with a terrace, barbeque and wine fridge. What else could we need? The weather had turned kind as we had arrived in stormy winds and thunder and lightning. At last we saw NSW in all its glory. Sophie had arranged her overtime so that she was with us for the whole of the first week and on our return from the wine country we spent the next few days exploring Sydney. A trip to Australia just wouldn’t be the same without a peek at the Great Barrier Reef. It is quite a long way away from Manly though, so John, Lesley and I flew north to Cairns where we could join a tour out to the reef. It was worth every dollar and even though it was a grey day it was an amazing experience. I don’t do snorkelling but was enchanted to see the reef and wonderfully coloured fish through the windows of a semi-submerged sub. We also visited the Daintree Rainforest and hoped to find a Cassowary. No such luck, sadly, but we did have the chance to taste some locally made ice cream. Check out those flavours! Our final week included a trip to Melbourne and this time Sophie was able to come with us. We loved this quirky city with its mad architecture, huge malls and hidden gems in the lanes but we all agreed that Sydney with its beaches and bays and ferry rides is the place for us. Bondi was exactly as we expected. Full of beautiful young people dressed in very little, chilling out on the beach or riding the waves. Great fun, buzzing, but rather exhausting! We went whale watching too and were just at the end of the migrating season. Our hopes weren’t too high, although secretly we all had our fingers crossed, but the whales didn’t disappoint and we saw three pods finishing up with a mother and baby who leapt about in front of the boat. I hope that Sophie and Sam will be back in the UK next Autumn, perhaps living and working in London, but, if not, at least I shall have a reason to go back (this time with Robert) and see more of that wonderful country. When I was working at Norwich City Football Club I accidentally poured red wine over Delia’s hand! This year ENOS will be entering a tree into the Wroxham Christmas Tree Festival, an event which takes place bi-annually. The trees are decorated to the theme of each organisation. This year they have over 50 entries. Visitors to the festival can nominate their favourite trees and a prize will be given to the winner in each category. We are asking ENOS members and Patrons if they would like to donate a Christmas tree decoration themed to a G&S show. 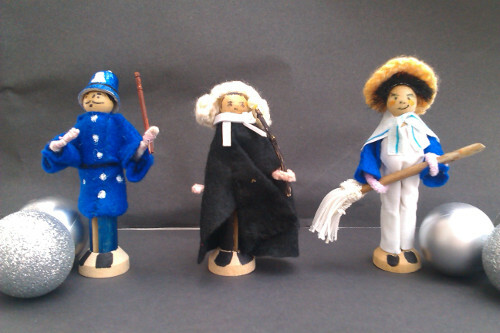 We have had some superb dolly peg characters made by several members already but would gratefully receive any others. It can follow the theme of dolly peg characters, iconic props from a show or musical instruments. I am asking that we receive donations by Tuesday 25th November. It is a wonderful community event which helps raise funds for the church and other local charities. The festival will be open from 10.30am to 5.00pm each day. Entry is £3.50 for adults and £1.00 for children to include a catalogue. The event takes places at Wroxham St Mary Church Saturday 29th November – Sunday 7th December. If you have any questions please contact Rachel Goodchild rachelgoodchild@hotmail.co.uk or Sue Norgate. Congratulations to Sally-Anne Davies (Sheila's granddaughter) and her husband Murray on the birth of their daughter Freya. A sister for Felix. A Celebration of Christmas Songs and Carols by the Sprowston Parish Players 7.30 p.m. Saturday 13th December at St Cuthbert’s Church. Wroxham Road, Sprowston, NR7 8TZ. Audience Participation. Adults £5.00 Children free (Refreshments included). Tickets from: Sheila Tuffield (01603 419896) or pay on the door. Proceeds in aid of Church Funds. Follow the legendary Robin Hood, as he battles the evil Sheriff of Nottingham, to free the land from tyranny. Robin is aided by his merry men: Little John, Friar Tuck, Alan a Dale, Much et al. The evil Sheriff is hindered by his hilariously idiotic henchmen, Nickit and Scarper, and his malcontent Soothsayer, who fails miserably in her attempts to foretell the future in her crystal ball. Both Robin and the Sheriff are distracted by the beauty of Maid Marian, whose nanny, Nora Tittle Tattle, adds another level of nonsense to this highly entertaining pantomime. There is much mayhem and merriment, lots of audience participation, and with lavish settings and colourful costumes, HATS can promise a spectacular show. Performances are at the Village Hall, Horning, Norfolk NR12 8LQ on Thursday 15th January, Friday 16th January and Saturday 17th January (at 7.30pm) and Sunday 18th January (matinee at 2.30pm). Doors open 30 minutes before ‘curtain up’. Ice creams will be available to purchase during the interval. Tickets are priced £6 Adults and £4 Children (16 and under). Seats may be booked by calling Julie or Chris on 01692 678145 or in person at either the Horning Post Office or Sentiments Newsagent in Hoveton. The Jay Singers Christmas Concert 'French Noel’. An evening of Christmas motets and carols by Poulenc, Britten, Taverner, Rutter to name but a few. We are sad to report the death last month of Ann Roy. 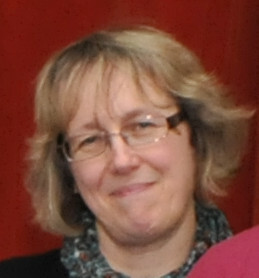 Ann had been a patron and supporter of our society for many years. We extend our sympathy to the Roy family; she will be greatly missed.